If ever there was a favorable moment in time to be in the market for a high-end, it's got to be right now. It certainly feels like the flagships of the day are more polished than ever before. HTC's newly released 10, along with Samsung's slightly older Galaxy S7, are two great examples. Among our favorites for a best-of pick for the first half of 2016, these two check all the right boxes, and more. However, it's impossible not to appreciate the differences in underlying philosophy and subsequent execution with both. It's high time we took a closer look and examined what these are and what they entail. While metal-made flagships are feeling like the norm today, it wasn't too long ago when we were dealing with predominantly plastic creations. While a practical pick—and also cheaper to implement—plastic has often been a thorn in the eye of those looking for a premium Android buy. That is, until the HTC One from over three years ago. Still regarded as one of the most compelling designs HTC has ever come up, it's with a sigh of relief that we saw the company continue along that familiar tangent with the 10. Also featuring an aluminum body, the HTC 10 is a sight to behold in a mannish kind of way. It's a man's tool, not a boy's toy, but also different from its predecessors, with capacitive navigation keys, and none of them front-firing BoomSound speakers. 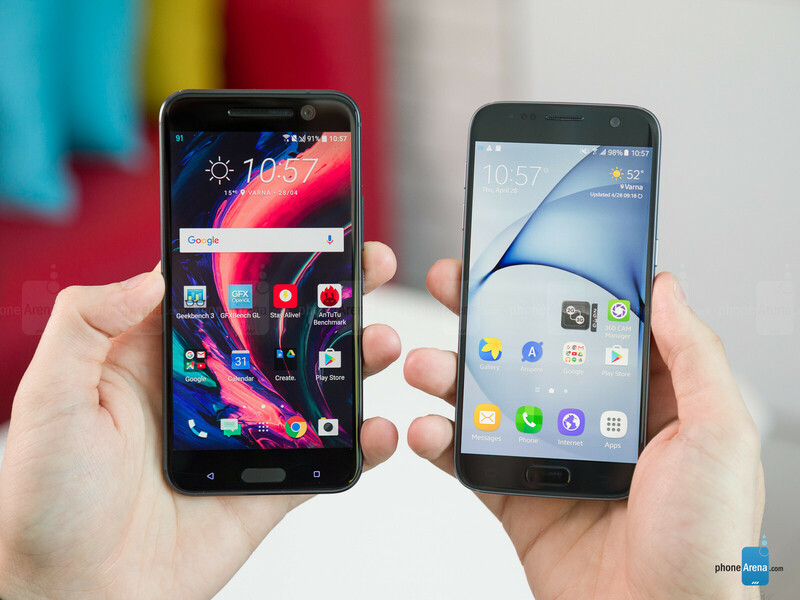 If we were to extend the macho metaphor a little bit further, we could say that while the HTC 10 feels like your typical, American muscle-type car, the Samsung Galaxy S7 would be the slick convertible that has a more universal and unisex appeal. A blend between glass and metal, the S7 is smaller, thinner, and lighter, all the while offering perks such as IP68-certification, meaning it's dust-tight and water-resistant. When it comes to objective factors, such as ergonomics, we have to give it to Samsung here: the S7 is all-around smaller and easier to handle, and more grippy due to the glass backplate. On the other hand, we prefer the ridged power button of the 10, along with its more easily accessible volume rocker—in comparison, reaching the volume keys on the S7 is a stretch unless you're left-handed. After years of sticking to smaller displays with lower resolutions than its rivals—which wasn't necessarily a bad thing—HTC is finally beefing up on the specs with the 10. Packing a 5.2-inch LCD display with a Quad HD (1440 x 2560) res, the HTC 10 is evenly matched against the Galaxy S7 and its 5.1-inch AMOLED panel with the same pixel count. Rest assured that both provide an incredible level of detail—more so, in fact, than needed. The Galaxy S7 wins out in terms of brightness —both at the top and low end. Peaking at over 480 nits and managing as little as 2 nits, Samsung's flagship overshadows the HTC 10, which is dimmer when it has to be bright, and brighter when it has to be dim (before you hit the sack). Finally, it ought to be mentioned that the Galaxy S7 has an Always-On display feature, meaning it will display information even when the phone is sleeping—information such as the time and date, or your calendar. However, since this drains the battery and is of questionable use, we're unwilling to shoot some extra points over to Samsung's camp over this one. Who cares you paid Samsung Fanboy. M10 is clearly the better phone. Actually speaking, M10 is not a better phone than s7. It falls short in most of the cases except the interface and audio dept... Just bcoz im speaking favour to s7 dont call me a fanboy!! Its the fact in all reviews!! I don't care which is better than the other cause i believe a phone should fit the user. but 1 line of your comment got me wondering. "infact s7 has IP68 rating which is the most useful thing a phone must have" Which phone did you use before the s7? So I checked your profile, you've never owned a IP68 phone until now, even though Sony has been selling one for years. If that is your most important factor, why no Sony phones before? Also, Samsung made ACTIVE phones before, but you didn't own those either. Is it only because it is pretty much the sole differentiator that Samsung has over its major competitors (minus Sony) that you are trumpeting it? Your profile notes you have a Samsung GS3, GS6 edge, GS7 edge, and Apple iPhone 6, and had LG G2 and G4 before. U can wonder as much time as u want. But water resistant is d most important thing a mobile must have... if u drop it in the water there r so much possibilities to completely lose ur mobile and evn its harder to restore ur important data. But if u drop it on the floor there wont b much internal components damage n u can easily replace it. In tat aspect i said ip68 rating is must for all d mobiles. Well took you long enough to figure out then or is it just because samsung has it now? It's only as important as you make it. For me it's important i like to wash my phone when i get home from work. Others wouldn't mind. This is the only site that gives underwhelming results in battery life to the S7 duo (probably something to do with their testing process), in almost every other site you will find that s7 battery duration is equal (if not better) than the HTC10 in real situations. Also, even if HTC 10 UI may be really smooth, S7 opens apps faster as you can see in this comparison.https://www.youtube.com/watch?v=8O66SPjbDdw Multitasking is not even a valid point since both devices can open more apps than most people would normally use before running out of Ram (as you can see in the video above) As for the camera samples after patch I would like you to share your findings since I haven't found camera samples (or comparisons) using the new software of the HTC10. Biased towards Samsung? On PA? What articles have you read. Even when in every srticle where the Galaxy was CLEARLY the winner, PA chose the other device. EVEN HERE! More especially when its vs Apple. They cant even be this biased when its the Galaxy vs Motorola, or Sony and many others. Because then they would look even more insanely stupid. But please enlighten me as to when PA was biased towards Samsung where they shouldn't have been. I wanna see it. Is this an ad? Kind of sounds like one. In terms of the HTC 10 being better than the Samsung S7, I'd point to PhoneBuff's Speed test and drop test videos. You can find them on Youtube. Also pretty much any review of the sound quality. No, Samsung S7 is faster in the UI allround. Don't lie. then u dont have to compare both the mobiles and put this article ;) ..!! I don't know why didn't any review mention the huge advantage of "uh oh protection" program of HTC 10. You would get a new phone if you break yours for free! ignorant HTC fanboy / anti Samsung automatic praise of Samsung = paid by Samsung? Lmao. I have to say the s7 is a better choise. Still waiting on sony to see if they can pull a rabbit out of that hat before making up my mind. 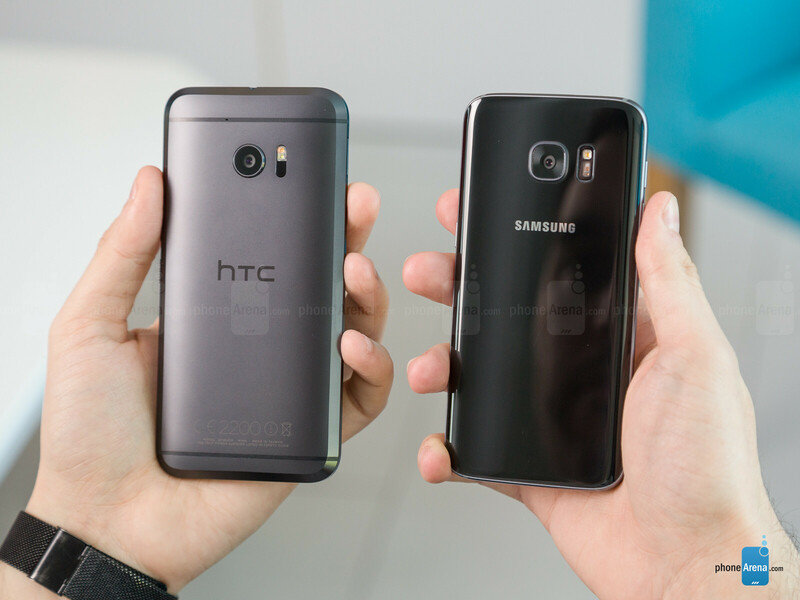 But so far the s7 looks like the one to beat IMO. But i am not a TW fan so if i can avoid samsung i will, but since both LG G5 and HTC 10 came up short on the battery those are out of my list.